p is also for peace, not surprisingly peace was the first p word played when the mouse premiered the alphabet game! this week I have been immersed in assembling and reassembling pieces - I'm not talking metaphorically but rather quite literally as I have been busily working on constructing a quilt. 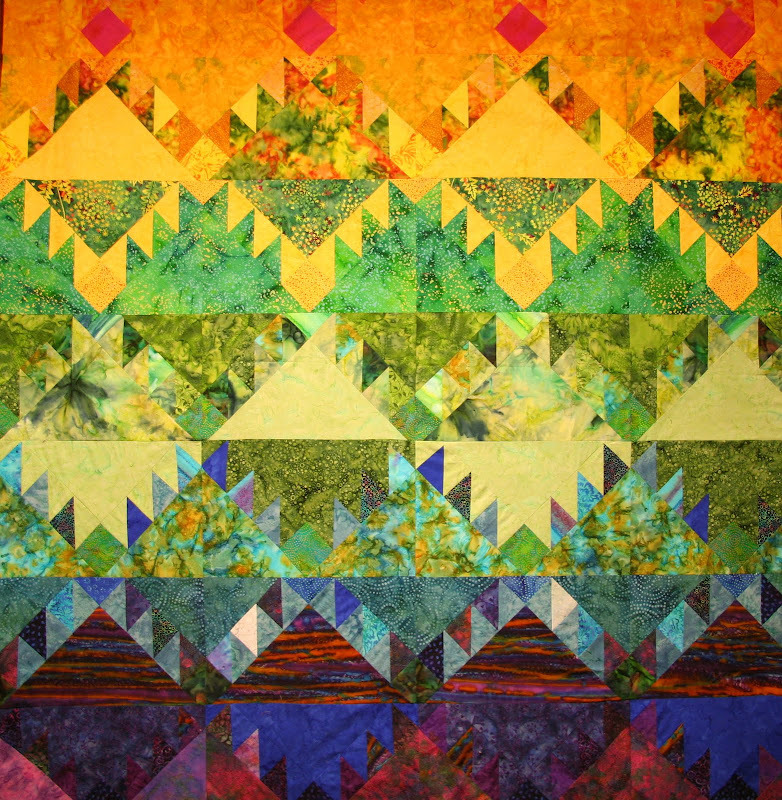 it is difficult to say what is my favorite part of the making a quilt, but piecing a quilt is right up there with selecting the fabrics for a project. I'm almost finished piecing the quilt pictured above, all I have left is to add the borders; once the borders are done the piece will be ready for quilting. quilting is the perfect word for the letter q - but, alas, I used that word the second time I played around with the alphabet. p is also for pesto. the word pesto is derived from pestâ - and means to pound. 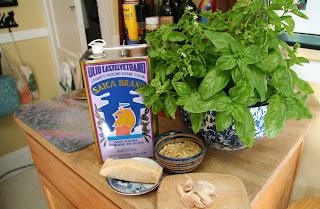 the traditional process for making pesto is to pound the ingredients - basil, nut, garlic - with a mortar and pestle. instead of a mortar and pestle I use a small food processor (but you can also use a blender). so one could say my sauce is made from the pieces of my ingredients. this is the time of year I put up pesto to last until next year's basil harvest. first chop up basil, garlic and salt into fine bits with the small food processor. next, crush the pine nuts and then add to basil and garlic, chop some more and throw in the cheese. finally add the olive oil a small amount at a time - my appliance has a small hole on top and I slowly pour the oil through that while mixing. use any way you like. some people say not to add the cheese if you are planning on freezing the pesto. I have both added the cheese and not added the cheese, and to tell you the truth, I haven't found that the cheese in anyway compromises the integrity of the pesto. gorgeous colors and pattern. Do show the finished piece when you're done. pesto: same observation over here, it keeps just as well and tastes just as yummy either way so mixing in the cheese at the same time makes more sense to me. Betty: love her. I'm a total klutz with a sewing machine so I could sing right along with her. On the other hand, given the top photo on this post, you find your way around a sewing machine pretty well, yes? kimy, you do some really great work on these. And looks like we're both doing some "reassembling". But I like yours better :) Happy week-end! Wow! That's an incredible quilt! And another pesto fan here, although I have an alternative pesto - Cilantro instead of Basil. Yum! That quilt is utterly gorgeous!! Yummy...your quilt is a yummy work of art. I suspect the pesto is as well. I took down the recipe so that my kids and I can make it this week. Thanks for sharing. Is there no end to your talents? Fantastic pattern, it looks very complicated! I too would love to see the finished product. Just gorgeous colours. I don't store pesto, just make it as we need it. Fresh is best and all that! Perfect prose for this peaceful post on pieces and pesto. I wonder if all seamstresses wore Catholic school uniforms? Did I mention that the quilt is fantastic? thanks everyone for the pats on the back and the songs of praise. I love cilantro, but never tried cilantro pesto! will have to give it a whirl. hey, merle, I'll have to investigate that relationship... I wore catholic school uniforms for many years myself. my favorite one was the one from our lady of guam!!!! skip, am always happy to plant an earworm!